Not all CD audio tracks are created equal and while professionally produced discs normally have acceptably normalized tracks, not every one does. Different gain levels exist and MP3Gain was created to tackle this. This program analyzes and normalizes the MP3 files you select and it optimizes them without a loss in sound quality. 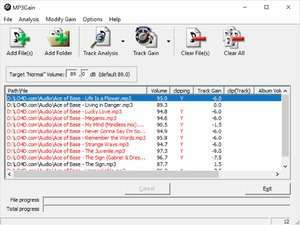 If you're unsure about making changes to your MP3 file, MP3Gain gives users the option of analyzing the suggested changes before actually writing them to disc. Version 1.2.5 is a freeware program which does not have restrictions and it's free so it doesn't cost anything. For security reasons, you should also check out the MP3Gain download at LO4D.com which includes virus and malware tests. Additional screenshots of this application download may be available, too. MP3Gain has a presence on social networks.